The 2013 KEMSA Award Winners were recognized at the 2013 Last Blast of Summer “Honoring Our Own” Awards Banquet on Saturday, August 10, 2013. Learn about why they were nominated below. Photos are taken with KEMSA President Dave Johnston. Chy Miller, former Director of EMS Education at Hutchinson Community College, was the recipient of the 2013 Lifetime Achievement Award posthumously from KEMSA. His children accepted his award. On March 7, 2013, the Kansas EMS community was shocked to learn of the untimely death of Miller due to a brain hemorrhage. Miller had forged an indelible impression on all the best Kansas EMS has to offer, and though the initial shock of his loss was great, the Kansas EMS community paid a great tribute to Miller with the Lifetime Achievement Award for his profound contributions to EMS education. His children were present to accept the award. Miller grew up in Rice County in the community of Sterling and everyone knew him. He entered the world of EMS shortly after graduating from Sterling High School and worked hard to become a Paramedic. Like many new “change the world paramedics,” he worked for several agencies including Pratt County EMS, Arkansas City Fire/EMS, and McPherson EMS. After a short time away from EMS, Miller jumped back into EMS with both feet and eventually became the Program Director for EMS Education and Department Chair for Public Safety at Hutchinson Community College. He held that position at the time of his death. Miller was also a past president of KEMSA. This award is awarded to any Kansas Certified EMS attendant whose contributions to pre-hospital care have been consistent and long lasting, representing in effect, a lifetime of outstanding service to the profession and to the public. This is the first time this award has been awarded posthumously to someone who only lived 41 years. Usually a lifetime is much longer. 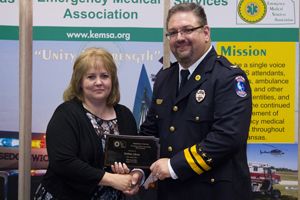 Kathy Coleman, EMT, Secretary/Treasurer, and Training Officer 1 with Miltonvale EMS, was the recipient of the 2013 EMT of the Year Award from KEMSA. Coleman is also responsible for all the training within Miltonvale EMS and recently helped two EMT students pass their practical skills so they could become valued members of Miltonvale EMS. Coleman has done all of this while being fairly new to the EMS profession. In 2010, she was approached about taking an EMT class in Miltonvale and completed her certification. After the first 6 months volunteering at the service, she started going to Region 4 meetings and discovered there were many things she could be doing to improve the service, equipment, continuing education for the staff, documentation and overall patient care. She became a Training Officer I in 2011 and also a Program Provider. She became a CPR instructor at the beginning of 2013. Prior to her work in EMS, she was active in her community by being on the school board, a member of the Lion’s Club, and other organizations. Now all her volunteer time is dedicated to EMS for her community and the surrounding area they serve. This award is for a Kansas EMT who has significantly contributed to EMS at the community, state and/or national level. It can be any level of EMT. 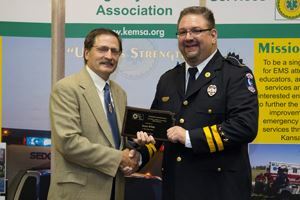 Clarence Banzet, first responder (FR) with Kiowa County EMS, was the recipient of the 2013 EMS Support Person of the Year Award from KEMSA. Banzet works full-time for the City of Greensburg, Kan., but he is a certified first responder who volunteers for multiple fire departments and Kiowa County EMS. In 2012, he put in nearly 2,200 hours for Kiowa County EMS covering mostly nights and weekends. This was the third most hours of anyone on the department behind the director and assistant director who are full-time EMS employees. According to the nomination, “[Banzet] is always willing to step in and help when needed while maintaining a great attitude. He is always saying ‘I am just trying to help make the community better.’” Banzet’s commitment and dedication to his community along with his dedication to continued online or face-to-face training, monthly meetings, and maintenance of skills and knowledge make him worthy of this award. This award recognizes an individual whose efforts enhance EMS in Kansas through their actions as a First Responder, Nurse, Dispatcher, Law Enforcement Officer, Pilot, Supervisor or other individual who would not fit into the other categories for individual recognition. Nominations had to include information about a continuous positive effort by the individual to enhance the quality of EMS or a specific event. 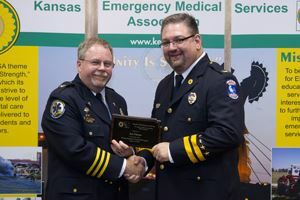 Jon Friesen, Division Chief – Education Manager, Wichita/Sedgwick County EMS System, Office of the Medical Director, was the recipient of the 2013 Donald E. White Educator of the Year Award from KEMSA. On March 7, 2013, the Kansas EMS community was shocked to learn of the untimely death of Chy Miller, Program Director of EMS Education at Hutchinson Community College. Miller also taught a paramedic class that had just started its second month of instruction. After his funeral, the HCC EMS Advisory Council convened to discuss the future of the HCC EMS program, and in particular the paramedic class. They were adamant that the class would continue, so they began their search for a qualified instructor willing to take on this task without advance notice. The council identified Friesen as the one educator whom they felt was uniquely qualified and capable of taking on such a challenge. Friesen was busy with his full-time job coordinating EMS education in the largest EMS system in Kansas yet he agreed to help make a lasting contribution to quality EMS and teach the paramedic class. Now, after 14 years with W/SC EMSS, Friesen is making a career change. Teaching this paramedic class reminding him how much he missed the classroom. So, Friesen has accepted a new position, returning to HCC as a full-time paramedic instructor where he will continue to provide quality education for EMS. This award recognizes an outstanding instructor of initial or continuing EMS education. The nominee must be a Kansas Instructor Coordinator or Training Officer who is recognized by the Kansas Board of EMS to conduct initial courses of instruction or continuing education instruction. 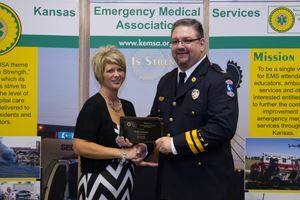 Debbie Glenn, service director of Ellinwood EMS, was the recipient of the 2013 Administrator of the Year Award from KEMSA. In addition to the reasons above, Glenn was nominated for recognizing the needs of the service and making changes to accommodate those needs. One example is the increase in call volume during the day time. The service was a volunteer department with just one full-time director at this time. Glenn gathered all the information and statistics and took it to the city council. She got it approved to hire four part-time people to help with the call volume Monday-Friday from 8-5. Glenn is not just a service director, she is also an educator. She has taught a variety of classes including continuing education for her service and Burdett EMS. She also does CPR classes for the community, and started an EMT class at Ellinwood High School. While running an EMS service, Glenn also finds time to be a board member for several organizations. In order to get this award, the nominee must be an administrator who has made a significant contribution to EMS Administration on a local, state or national level, and whose primary responsibility is the direction of individuals involved in the delivery of pre-hospital care. Dr. Lester “Rich” Richardson, emergency department physician with Shawnee Mission Medical Center, was the recipient of the 2013 Physician of the Year Award from KEMSA. Dr. Richardson was nominated for being a critical part of Johnson County emergency medical services for many years. He first served as Johnson County Med-Act’s medical director from the 1980s until 1999. In 2007, he returned to serve as medical director for Overland Park Fire Department. He then expanded this role to serve as a county-wide medical director in 2009. This laid the groundwork for a county-wide full-time medical director program that began in 2013. After establishing the county-wide medical director program and setting a firm foundation for the future of EMS in Johnson County, Dr. Richardson retired from his EMS work in 2013 and still continues to work as an emergency department physician. Dr. Richardson's work as medical director has assured superior patient care for patients in Johnson County. He has been a visionary leader, implementing science-based medical protocols in advance of many similar communities. Throughout all his work, Dr. Richardson remains humble and committed to service. He has been a tireless and effective advocate for patients and EMS providers. He is naturally collaborative and has been successful in environments that are sometimes politically challenging. As an EMS leader, Dr. Richardson has worked to expand knowledge, allow judgment and enable systemic improvements. His leadership has assured that medical emergencies in Johnson County have the best possible outcome. In order to get this award, the nominee must be a Kansas licensed physician who provides commendable service to the benefit of EMS in Kansas. The physician can be an Emergency Department physician, service Medical Director or any other physician who has provided a positive impact to Kansas EMS. Minneapolis Ambulance Service was the recipient of the 2013 Community Service Award from KEMSA. Minneapolis Ambulance Service supports their community in several ways. First, it promotes healthier living habits by holding several booths throughout the year to inform the community about what they should eat. The service is also striving to bring awareness to the community about the “File of Life”, and the importance of having health information readily available to EMS in the case of an emergency where they aren’t able to give the information. Minneapolis Ambulance Service also reaches younger ages by visiting the local high school, grade school, and day cares to show the children what EMS is all about and how they shouldn’t be afraid to call for help. Throughout the summer, personnel also attend day camps for local groups to talk about 911 emergencies. This award is awarded to an individual or team who has been involved in the development of innovative approaches to injury / illness prevention or EMS awareness within the community. 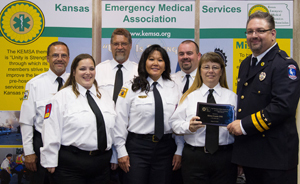 Nominees are any Kansas Certified EMS attendant or EMS agency licensed by the Kansas Board of EMS. 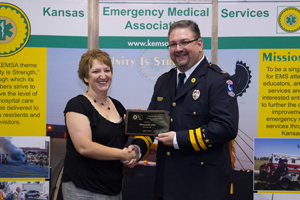 Kiowa County EMS was the recipient of the 2013 Type II Service of the Year Award from KEMSA. Kiowa County EMS (KCEMS) provides services to 720 Square miles quickly, efficiently, and at a high level. There is a full-time Director, Assistant Director, and EMT who run the day-to-day operations with the help of 10 part-time/volunteer staff. Overall, there are thirteen crew members with 1-First Responder, 1-First Responder/RN, 4-EMTs, and 7-Paramedics. Having a staff of 13 with 7 paramedic providers is unheard of in rural EMS. Even though they are only required to provide basic life support they have worked to ensure advanced life support is available over 95% of the time. All of the crew members believe EMS is a calling and not just simply a job, which is easy to identify with the commitment they provide on a daily basis. Rural EMS provides many challenges and KCEMS works tirelessly to find ways to ensure crew members are proficient in their skills and knowledge. Recently, they implemented a new, innovative training plan that utilizes online training for knowledge and schedule flexibility for skill training. Crew members have one month to complete both an online training course and a practical skills program. The innovative part is that crew members actually pick when they will complete the training based on their availability and not based on a set schedule. Providing this flexibility has increased training attendance by nearly 50% and ensured crew members remain proficient. High quality care and dedication are great reasons for this award, but KCEMS is also deserving because of their involvement in the community. KCEMS provides training to Kiowa County Memorial Hospital staff, it is the lead agency for Kiowa County Safe Kids and other events like bicycle safety, pool safety, Walk to School Day, etc., staff provide free CPR throughout the community, and they have started an annual Breast Cancer Research Foundation Fundraiser. This award recognizes an EMS system that exemplifies outstanding professionalism and service to the community it serves. It can go to any Kansas licensed Emergency Medical Service as a Type II or Type IIA, except those in which NAEMT leadership participate. Jason White is the recipient of the 2013 Presidential Leadership Award from KEMSA. 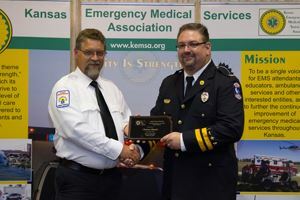 Each year, the KEMSA President gets to choose a KEMSA member who helps KEMSA grow and progress and honor them with the Kansas EMS Presidential Leadership Award. 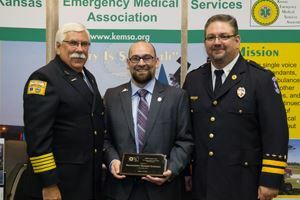 White was chosen for this award by current KEMSA President Dave Johnston because of his work behind-the-scenes to really make things happen with EMS legislation during the 2013 session. White worked humbly over the past year to improve the quality of EMS through new legislation, and he pushed through all the hurdles to make sure things got passed. Along with making appearances in Topeka and keeping the KEMSA Legislative Committee chair informed about the happenings in Topeka, he also provided KEMSA with weekly updates regarding legislation affecting EMS. These reports were then distributed to KEMSA members to keep them informed. Any time that an EMS related bill needed testimony or action by KEMSA members, White informed KEMSA and the Legislative Chair of the immediate need. Then KEMSA coordinated efforts to get action taken for certain pieces of legislation. HB 2183: the Communicable Disease Legislation (later named the “Chy Miller Bill”) was one piece of legislation that White monitored up until the very end of the session. It was an important piece of legislation for public safety responders and healthcare provides because it updated an out-of-date statue that did not provide enough protection for providers potentially exposed to communicable diseases. The legislation attracted far more controversy than KEMSA expected. White was there through it all keeping KEMSA members informed and letting them know when to make their voices heard. It was because of White’s work behind-the-scenes that helped make this and other EMS initiatives possible in 2013. White works with for Mid-America Regional Council Emergency Rescue (MARCER) located in Missouri. On July 31, White was honored with the Missouri Emergency Medical Services Association (MEMSA) Presidential Leadership Award for his work on legislative efforts for EMS in Missouri as well. He was truly an asset to EMS in Kansas and Missouri this past year. Kansas Representative Marshall Christmann was the recipient of a 2013 Support Award from KEMSA. This award was created by KEMSA in 2013 to recognize individuals outside of the EMS profession for their tireless efforts in promoting EMS in the state of Kansas. Representative Christmann serves the 113th District in the Kansas House of Representatives. He is originally from Kaneohe, Hawaii and currently lives in Lyons, Kan. He graduated from Kalaheo High School and Hutchinson Community College. He is a municipal judge and chief labor negotiator. 2013 was his first year as a representative. Representative Christmann was particularly helpful to KEMSA with HB 2183: the Communicable Disease Legislation (later named the “Chy Miller Bill”). It was an important piece of legislation for public safety responders and healthcare provides because it updated an out-of-date statue that did not provide enough protection for providers potentially exposed to communicable diseases. Representative Christmann was the Floor Handler of this bill for the House of Representatives, and the person who came up with the idea to name it after EMS professional Chy Miller, who passed away suddenly in March 2013. Representative Christmann was Miller’s legislator and had met him about this legislation. To get the bill named after Miller, Representative Christmann had standing to seek the naming because he was Miller’s legislator and the Floor Handler of the bill. KEMSA was very appreciative of this effort, and believes it was a great honor for Miller, his family, and EMS in general. Miller’s oldest daughter, Taylor, was on hand when Kansas Governor Brownback signed the bill. Kansas Representative Dave Crum was the recipient of a 2013 Support Award from KEMSA. Representative Crum is a retired Optometrist from Augusta, Kan. who was first elected to the House of Representatives in 2007. Prior to the House of Representatives he served as Mayor of Augusta from 1990 – 1998. Currently, Representative Crum is the Chair of the House Committee on Health & Human Services. In 2013, he led the efforts on the passage of the Communicable Disease Legislation, HB 2183. The Communicable Disease Legislation (Later named the “Chy Miller Bill”) was an important piece of legislation for public safety responders and healthcare provides. It updated an out-of-date statue that did not provide enough protection for providers potentially exposed to communicable diseases. The legislation attracted far more controversy than was expected. There was one un-intentionally caused conflict that led to large volumes of e-mails in opposition. Representative Crum quietly navigated the legislation through the storm by being remarkably easy to work with, easy to talk with, and very positive. 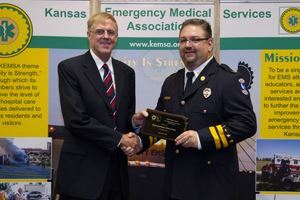 KEMSA was very encouraged by his support of Kansas EMS. 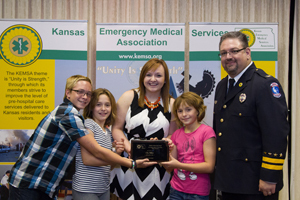 Rice County EMS is the recipient of the 2013 Cara Everhart Award from KEMSA in partnership with Kansas Emergency Medical Services for Children (EMSC). Rice County EMS (RCEMS) was nominated for its dedication to the needs of pediatrics in Rice County, Kan. through various avenues, most prominently being the Rice County Kids Safety Camp. 2013 marked the 10th annual Kids Safety Camp in Rice County. RCEMS partners with other public safety agencies to put on this 2-day camp for children at minimal cost to the kids attending. The purpose of the camp is to educate children on the safety aspects of several different activities, including but not limited to: archery, gun safety, severe weather, and first aid. The kids also get to tour ambulances, fire trucks, police cars, air ambulances and much more while being exposed to medical equipment and procedures during a mock car accident. The exposure to this equipment and these procedures makes the kids more comfortable if they were to ever in a situation where they experience these things. In addition, RCEMS participates in child seat safety and has certified Child Passenger Safety (CPS) technicians on staff to help inspect and install car seats correctly. Citizens can stop by the station to make sure their child seat is installed correctly. The criteria for this award includes an outstanding individual or group that has shown excellence and dedication to children through pediatric emergency care and/or family centered care. Eligibility includes any healthcare provider, healthcare organization, healthcare association, educator, or child advocate. This award is also sponsored by Kansas Emergency Medical Services for Children (EMSC), Kansas Department of Health and Environment.